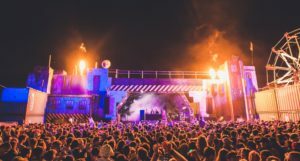 Farr Festival, which will be taking place 5th – 8th July, has added a host of new names to its already stacked line-up. Returning to the lush Hertfordshire hills, the festival has today added Daphni, Mount Kimbie, Lena Willikens, DVS1, Call Super, DJ Stingray, Roman Flügel and Shanti Celeste to the line-up. The festival’s live offerings are looking suitably excellent too, with Jacques Greene, George FitzGerald, Kelly Lee Owens, Paranoid London and Maribou State all confirmed to play the festival, which is just an hour away from the London. Other notable additions include Prosumer, Tama Sumo, Lakuti, Galcher Lustwerk, Job Jobse, Byron The Aquarius, DJ Richard and Shy FX. The new names join the likes of Moodymann, Dixon, Gerd Janson, Eclair Fifi and Mr G for the ninth edition of the festival. The festival is promising even more names in February, with Sunday’s line-up still to be unveiled.